The European Tyre and Rim Technical Organisation publish a standards manual with approved rim widths for all sizes of tyre. However, if a tyre is fitted outside of this recommendation, it does not necessarily mean the tyre will be incorrectly seated on the rim. Whether the tyre is correctly seated will also depend of the tyre make, load carrying capacity, rim design etc. 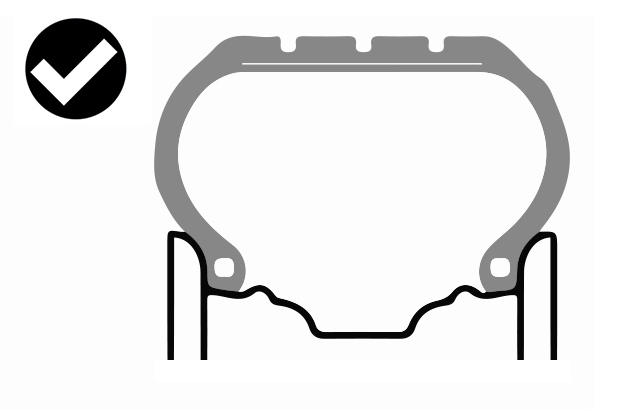 The following diagrams are representative of a correctly and incorrectly seated tyre. Diagram of a correctly seated tyre. The tyre bead sits on the wheel rim as intended by the manufacturer. 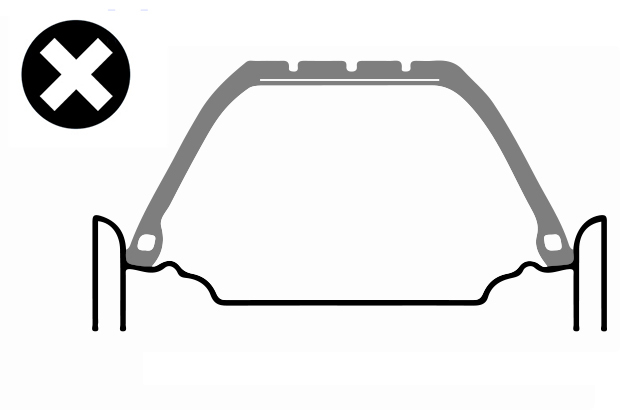 Diagram of an incorrectly seated tyre. Due to the tyre being stretched the tyre is no longer correctly seated on the wheel rim. 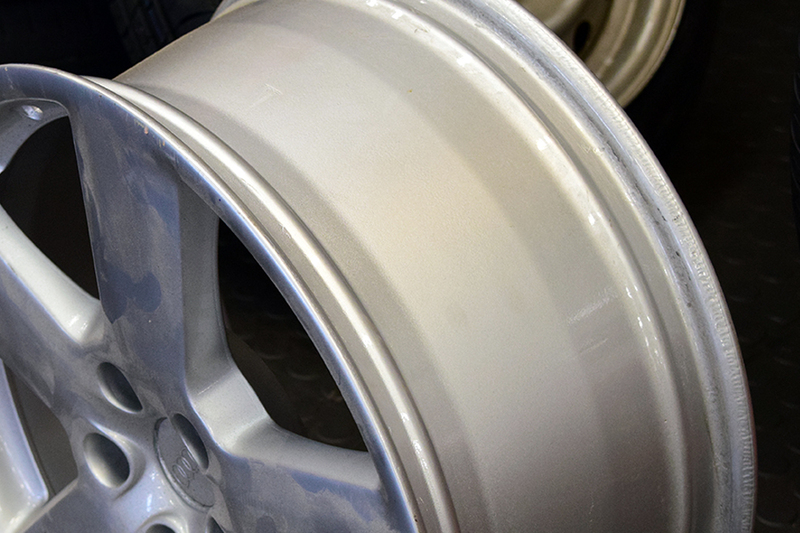 In this example, the wheel rim and tyre are incompatible and there is a clear gap between the tyre bead and the wheel rim because the tyre is over-stretched. When this happens, the vehicle should be rejected for the tyre being incorrectly seated on the wheel rim. Where this isn't obvious, the nominated tester should pass and advise. If you have any examples of extreme stretched tyres, please email the photos to MattersOfTesting@vosa.gsi.gov.uk. This article was updated on 26 May 2016 to include clearer diagrams of correctly and incorrectly seated tyres. Stop moaning .. its illegal to have stretched tyres .. Anything that is changed from factory standard must be notified to you insurance company.. if not, the police can check and you will be done. I've been driving on stretched tyres for 4 years now, current car drives comfortably, flat out round bends, anywhere at 285bhp with a 215 on a 10" rim. The reason we do this is so the rim can sit more flush against the bodywork and because we can...why not? I love reading people trying to talk about the dangers of it etc without any solid evidence at all. People live lives so conservatively! Don't like stretched tyres I have just done my three day mot Course and took this up with the tutor the funny thing was my so is into all this Euro style wheels so whilst going down a lane with his tyres euro style he hit a boulder in the road only at 30mph it totally took out his tyre and turned it egg shaped so this is one good reason why this method of fitting tyres should not be practised he had to get new tyres fitted this time he got the correct sizes . surely the manufactures could easily emboss the minimum and maximum wheel width for the tyre size on the tyre itself. this would make easier to check by testers. I am neither a tyre fitter, nominated tester nor do I have any connection with the motor trade. never seat down on a 13ins rim. or at worst take someone out with him/her. the wheel itself projects beyond, and are therefor a justifiable mot failure. Stretch tyres are a death trap full stop a tyre was designed so that when going around bends and corners the tyre wall would flex either a little or a lot but with them stretched tyres the side walls are already stretched to the extremes so the only thing that can happen with them is it pulls the tyre bead off it's seat and deflate. Surely the majority of those with vehicles fitted with stretched tyres and/or aftermarket HID lamps remove them before presenting? Is this not a matter for the Police to deal with? Maybe tyre manufactures should produce a list of maximum rim size per tyre width. Also i think its not just the boy racers to blame but the incompitent tyre fitters fitting these tyres. Before long theres going to be a serious incident witb this stupidity. Needs sorting before someone is seriously hurt. still a grey area over what is. are you saying if the bead has rotated 90 degrees or the face the bead can be seen. what would clarify it, is stating the tyres width can not be less than 90% the width of the wheel. it sounds like we have to be a technical engineer again, who,s to say what is safe or not ???? surely we should stick to what is reccommended by manufacturer. as with other aspects for mot. would it affect addhesion or water displacement etc. Hope this helps some testers out there. Diagram 2 isn't correct, in cases of extremely stretched tyres the bead doesn't rotate as in diagram 2 what actually happens is that the whole of the bead of the tyre doesn't contact the side of the rim. There is infact a gap betweeen the rim and the tyre and you can see the back side of the rim. The more extreme the stretch the more of the inside of the rim you can see. In the most extreme case I've seen (at a VW show) you could see the base of the rim! Blimey - nice to see common sense being employed! Not all 'stretched' tyres are dangerous if done within sensible limits and it's refreshing to see that that's acknowledged here. All Tyre Manufacturers design tyres to fit certain rim sizes and all rims are designed also to fit certain tyre sizes and they use the guidelines produced by ETRTO. This is in order to optimize the design for the four function of a tyre, to provide Friction for braking and acceleration, Steering, support the Load and vehicle Suspension. Coupled with these basic functions is fuel efficiency and long life all of these points defeat the function of a tyre when fitted stretched or Euro style. In my opinion they do not conform to the vehicles construction & Use, however I am pleased that this instruction and recommendations have been issued to vehicle testers, technical data is available for Tyres and Wheels at (ETRTO http://www.etrto.org). photos of an actual wheel rim and a stretched tyre would have been better . Michelin produce a Technical Data guide that gives Minimum/Optimum/Maximum rim widths for each of their tyres and it would be nice to be able to reference this info and include it in an advisory. I find it scary that cars presented with this 'styling' usually have budget tyres fitted. So not only are the tyres sub standard but they are also operating outside of their designed parameters. Defiantly illegal I'm afraid, and the police are having a massive crackdown on stretched tyres to the point that the police will now go to the tyre fitters them selves who can now get in more trouble for sending out a car in a dangerous condition, than the driver can get for using the car! So, to clarify, you can only fail if the bead is 90' rotated (a bead sealing surface now facing upwards)......which would never happen anyway as its virtually impossible to achieve..... the inflation pressure would want to pull the beads back into their natural position. Conclusion - you will never see that diagram so stretched tyres are OK. I'm used to seeing the opposite issue when some motorcycles are presented with a distorted profile rear tyre, being clearly far too wide for the rim it's fitted to. This definitely clears up some confusion on what seems to becoming more noticed on modified vehicles. Never seen a vehicle presented but I have seen some ridiculous examples on the road , goodness knows how they must handle. An insurance advisory message would certainly make the presenter pretty hacked off and aware of the implications in an accident or claim. not being funny but the second diagram could never happen. Shaun under normal circumstances you'd be right, these so called stretched tyres are inflated by igniting a flammable gas inside the tyre , the rapid expansion is how they r seated on the rim. will 165/45/15 pass if fitted on a 8j rim? I would suggest not - according to Michelin (sorry) the only 15" tyre suitable for an 8j rim would be a 225/50R15. are you having a laff ? I would not want to be on a road near you and your death trap. not likely , I have 195 50s on an 8 and they'll probably fail. looks like you made the wheel rim smaller on second pic, otherwise both pics would have the same amount of seal? please clarifiy. are you suggesting that if the beed can be seen then it must be illegal? even if it has the same amount of seal as an unstreched tire? would have thought, gov.uk could do better than that! lets have a properly tested engineering explanation thank you very much! The bead is rotated 90' on the stretched rim! The purpose of the two images is to show the same size tyre on different size wheels. The first being a wheel of the correct size for the tyre and the second being a wheel far too wide for the section width of the tyre. 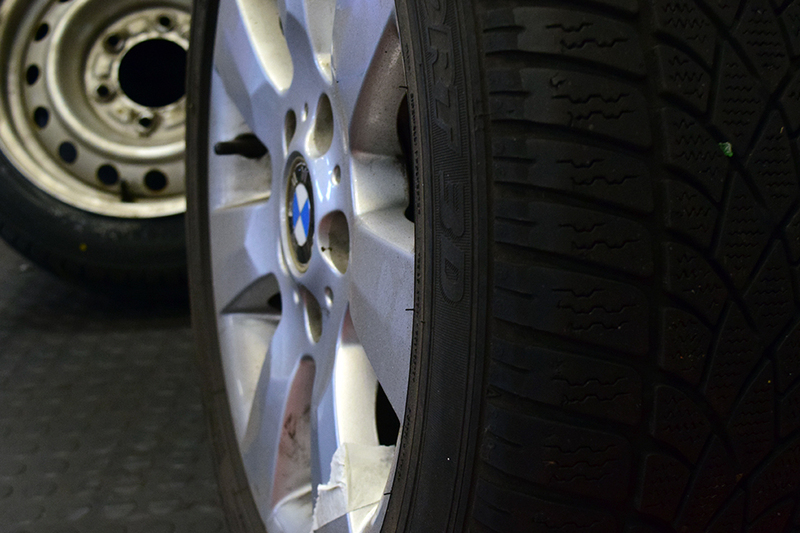 The second image shows that the tyre bead has turned through 90 degrees and the tyre is therefore incorrectly seated on the rim and is an MOT failure. The images are deliberately simplistic and are designed this way to get the intended message across, with the text between the images giving the engineering explanation for why the fitment shown in the second image is unacceptable. Very useful info. Explanation and diagrams are easy to interpret. here is a site where you can get loads of pictures so you can update this so people have a better understanding of what is and isnt acceptable.. as at the moment this is a poor example and still makes it a grey area. Sarah u must be thick for the bead of the tyre to sit as on second PIC it would clearly blow of the rim some people really aint all that clever plz revise and actually test in life not diagrams !!!! exactly!. simple diagram. if you cannot see the difference then maybe it's not the diagram that's simple? Well done DVSA for finally having the guts to clear this up!! Top article. thanks for good information will pass this onto my testers. stretched tyre info very useful. thank you.